Police officers walk in the backyard of Deutsche Bank headquarters during a raid in Frankfurt, Germany, Thursday, Nov. 29, 2018. German authorities raided Deutsche Bank's headquarters Thursday amid suspicions that its employees helped clients set up offshore companies that were used to launder hundreds of millions of euros. 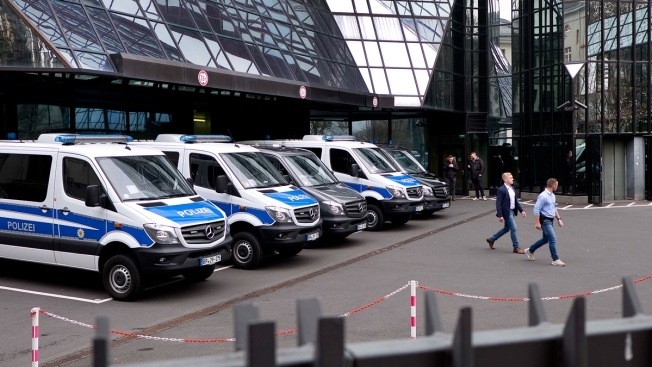 About 170 police officers, investigators and prosecutors swooped in on the bank's offices in Frankfurt and premises in nearby Eschborn and Gross-Umstadt at 10 a.m. (0900 GMT), seizing electronic and paper records. The investigation emerged from an analysis of documents leaked from tax havens in recent years, including the 2016 "Panama Papers," said Frankfurt prosecutors' spokeswoman Nadja Niesen. It is focused on two Deutsche Bank employees, aged 50 and 46, and possibly other still unidentified suspects, she said. At least one site raided was a suspect's home. Analysis of the Panama Papers and other documents "gave rise to suspicion that Deutsche Bank was helping clients set up so-called offshore companies in tax havens and the proceeds of crimes were transferred there from Deutsche Bank accounts" without the bank reporting it, Niesen said. In 2016 alone, more than 900 customers are alleged to have transferred some 311 million euros ($351 million) to one such company set up in the British Virgin Islands, she said. The suspects, both German citizens, are accused of failing to report the suspicious transactions even though there was "sufficient evidence" to have been aware of it. Deutsche Bank confirmed the search and said "the investigation has to do with the Panama Papers case." Money laundering has become a growing problem in Europe, where a series of scandals has exposed lax regulation. 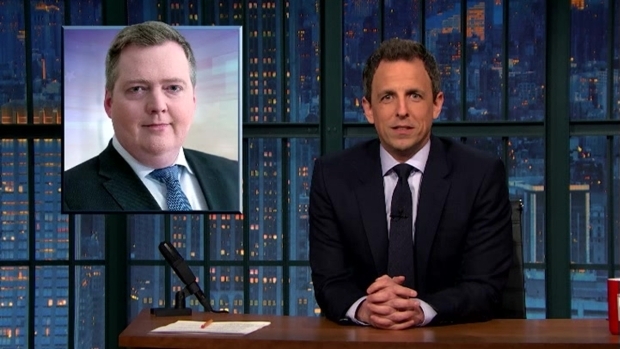 "Late Night" host Seth Meyers considers the corruption scandals that have popped up around the so-called Panama Papers. This story, Meyers said, is important because it sheds light on how wealthy individuals and organizations around the world hide their money from the public and avoid getting taxed. And it's not the first time Deutsche Bank has run into trouble over the flow of dirty money. It was fined more than $600 million by U.S. and U.K. authorities in January 2017 for allowing customers to transfer $10 billion out of Russia in what regulators said was "highly suggestive of financial crime." The Panama Papers are a trove of documents from a law firm that handled shell companies for thousands of rich and powerful clients around the world. While owning a shell company is not illegal, it is used to hide the beneficial owner of a company or transfer, making it important for the handling and laundering of dirty money. Several other institutions besides Deutsche Bank have been fined by authorities in the U.S. and Europe for not properly checking up on the beneficial owners of shell companies that send money through their accounts. Analysts say that because these transactions can be lucrative and punishments are lax, banks have few incentives to do more than the minimum required by law to check on the identity of a bank. "Even in the most egregious cases, banks are often only required to pay a monetary penalty for engaging in criminal activity, which is merely the cost of doing business," said Jimmy Gurule, a former undersecretary for enforcement for the U.S. Treasury Department. "The failure to hold banks accountable for money laundering encourages such criminal activity, including laundering hundreds of millions of dollars in Panama and other money laundering havens," said Gurule, now a professor at Notre Dame Law School. Most recently, Denmark's biggest bank, Danske Bank, admitted that some 200 billion euros ($235 billion) in suspicious money had flown through its Estonian branch from 2007 to 2015. Whistleblower and former employee Howard Wilkinson has indicated that Danske Bank's management was aware of what was going on at the branch, which was among the bank's most profitable units. He has also alleged that family members of Russian President Vladimir Putin and Russia's spy agency were using the bank for money laundering. The bank's CEO has since stepped down over the scandal. Another Baltic state, Latvia, has also emerged as a major hub of money laundering, with a 2014 leak showing that tens of billions of dollars were funneled from Russia in 2010-14. Some of the money reportedly went through Deutsche Bank and ended up in major capitals like London, according to The Organized Crime and Corruption Reporting Project. There was no indication that Thursday's raid was linked to that scandal, though Deutsche Bank says that it has since stopped providing dollar transactions in some countries, including Latvia.